This incredibly romantic wedding took place on June 3rd, 2017 at the Woodmark Hotel in Kirkland Washington. 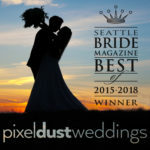 Recently Style Me Pretty, a website dedicated to all things pretty for your wedding day, featured the sneak peak video created by Pixel Dust Weddings and also photos by Blue Rose Photography. This beautiful wedding was coordinated by Emily at Sweat Pea Events. Erika + Arjay’s Wedding | Sneak Peak from Pixel Dust Productions/Weddings on Vimeo.